Social media for a small businesses can seem like a daunting task if you don't manage your time efficiently. Here are some quick tips to make sure you are getting the most out of your social media efforts. A complete profile is important to your customers, and even more so to potential customers. When you've taken the time to fill out your entire profile, it lends credibility and gives them an additional resource for your information. Take a look at your current content. What is working? What are your fans responding well to? Determining what is working well for you is a good baseline for your future content. If you are getting more engagements from infographic posts than you are video posts, its wise to continue to use infographics as your content leader. It is easy to get distracted during the day, luckily there are scheduling tools to make life easier. Most social media platforms offer a built in scheduling feature so that you can schedule your posts 2 or 3 days out, letting you post everyday, without having to remember to manually do it! Of course if something comes up and you want to post it when you think of it, you can always post right away as well! People expect a timely response when they interact with your business online...Take time and respond. It might seem like another to-do added to your never ending list, but responding to your fans and followers really goes a long way. Afterall, they're reaching out to you inquiring about your business, it might just turn into a quality lead for you! Make sure you are taking action when people have questions, complaints, or praise. Answering your customer's questions shows that you're involved and that you care, as does thanking them for their praise. When you address complaints, it not only gives you the chance to right the wrong doing, but also shows your customers that you have a vested interest in their concerns. VisionAmp Marketing offers a wide variety of services to help business manage social media and digital marketing better. 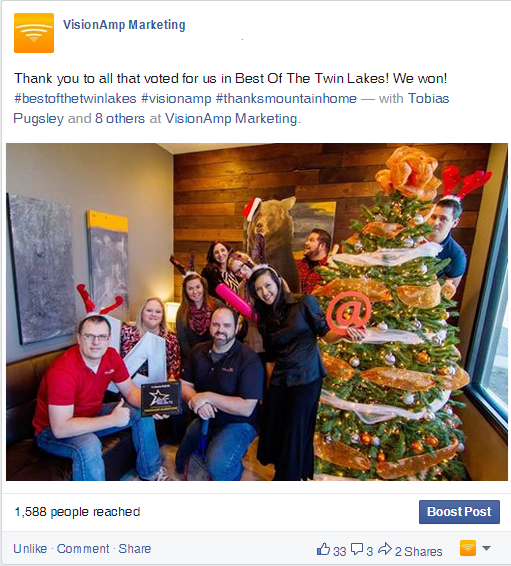 Give VisionAmp Marketing a call TODAY at 855.862.5491.